First off, thank you so very much to everyone who entered the Texting While Sewing Contest! I am so pleased with the number and quality of the entries. I am having the worst time ever narrowing them down to 10 before passing them along to our guest judges. I am going to buy myself a little time by sharing a block I just finished up for my Cocorico Bee. Kylie’s theme is The Best of the British. 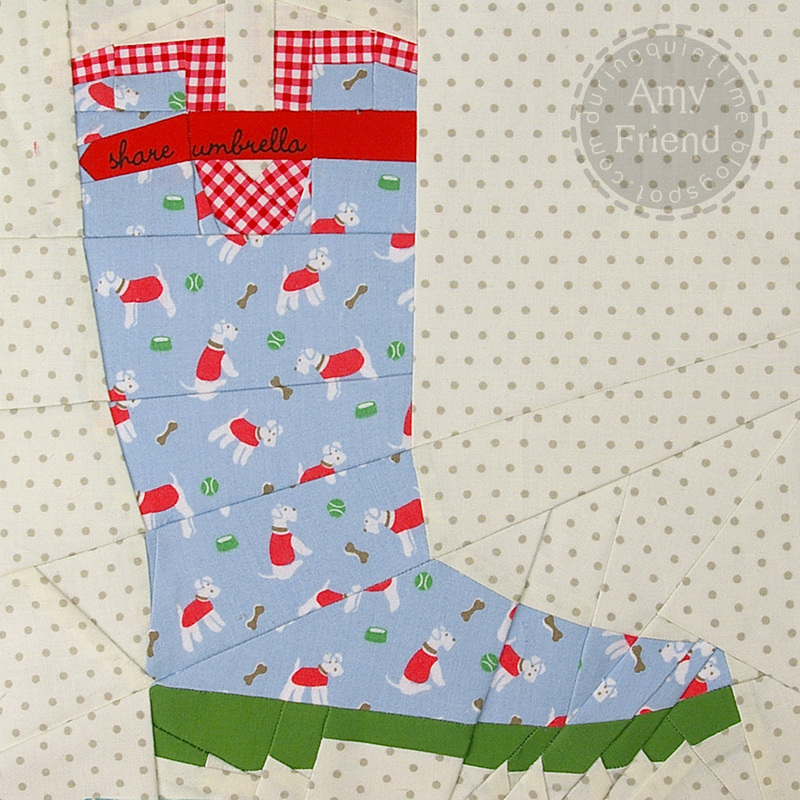 She has an inspiration board in Pinterest and one of the items there was a Cath Kidston Wellie with Mini Stanley print like this one here. As soon as I saw it, I wanted to make her a boot using my Garden Boot pattern. I also wanted to use British fabrics to make it a bit more special. 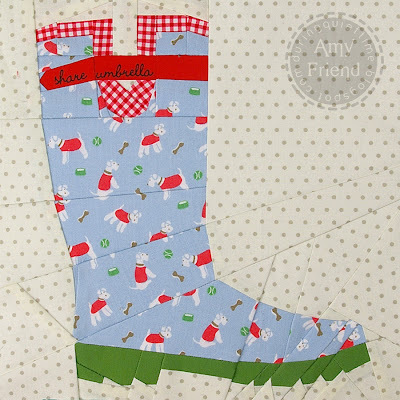 I emailed my “contact in the UK”, Kerry, and she actually had the same Cath Kidston Mini Stanley print that was used on the rainboot in Kylie’s inspiration board! I was so excited! I also knew I wanted to use my Kumiko Fujita for Yuwa print in red to fussy cut “share” and “umbrella” for the boot strap. I found that in Ayumi’s shop of course. The background fabric is Vintage Modern Dots in Natural from Fresh Squeezed Fabrics. I loved using it as a background fabric and can see doing so again. I also wanted to let you know that there are some newly listed seam ripper necklaces in my Etsy shop. If you are considering them for Christmas gifts, I would encourage you to pick them up now because my husband will not have a lot of turning time in the barn between now and December. I’ll be back soon with more contest news! I know everyone is excited to find out who won!